Most of the templates were built with Shape objects and Note objects instead of background images. So you can resize the objects and change the Color, GrandientColor and GrandientStyle properties of the objects to change the form style after you load the templates. Whether you prefer to distribute your projects via CD-ROM, USB stick, the internet, AutoRun Pro makes it a breeze with the handy Publishing Wizard. 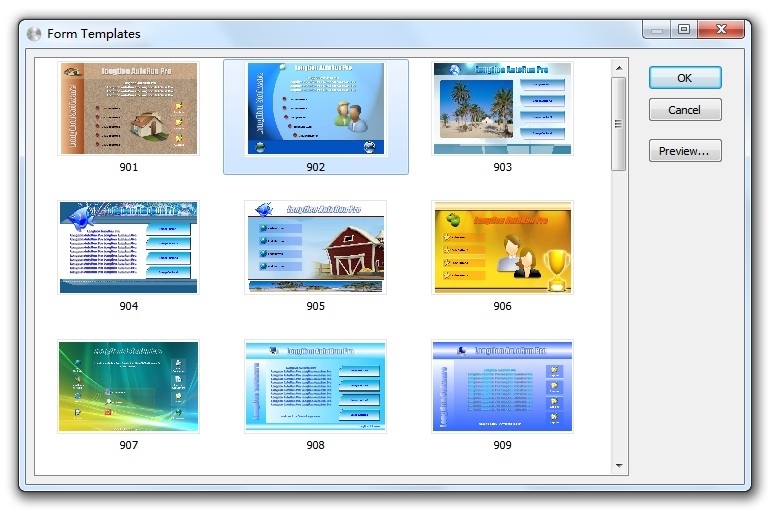 With just a few clicks you can generate all the files you need to get the job done quickly and correctly. 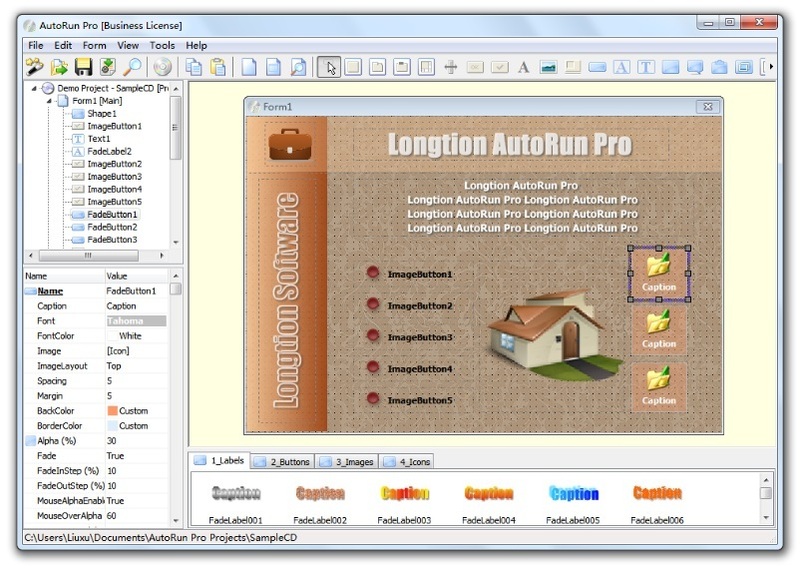 AutoRun Pro can even directly burn your autorun CDs or create ISO CD image files without any need for external CD burning software. Slide Show images (Photo album). 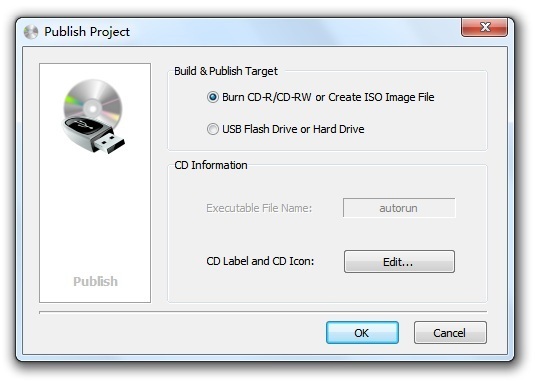 Burn project to CD-R/CD-RW or create ISO CD image file directly with built-in CD Burner. 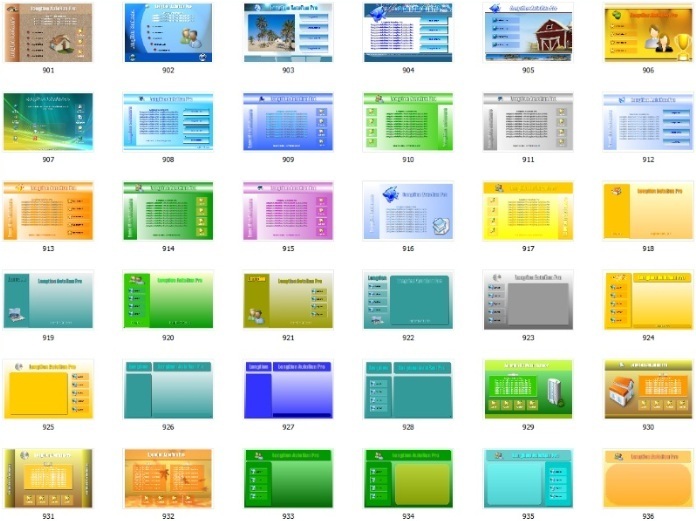 Publish project to new folder or USB Flash drive. Create drop down menu bar (main menu), tool bar and status bar for forms like most standard windows to make your form more professional. Create popup menu, you can define the pop-up menu that appears when the user clicks on an object or form background with the right mouse button, like most professional applications. 25 Objects: Panel, TabNotebook, TabSheet, GroupBox, ScrollBox, Splitter, Button, ImageButton, Label, Text, Image, Bevel, FadeButton, FadeLabel, FadeText, Shape, Balloon, Note, SlideShow, Memo, RichText, WebBrowser, MediaPlayer, FlashPlayer, PDFReader. The container object can serve as a container (parent) for other objects. The parent of an object is the object that contains the object. For example, if a form includes three ImageButton objects in a GroupBox object, the GroupBox object is the parent of the three ImageButton objects, and the ImageButton objects are the child objects of the GroupBox object.